The fall had been perfect. Glorious, oh. Sylvia was long past "a lack of fear." As she plunged toward the shattered roof, the city swelling up to meet her and the dwagon's limp wings flapping behind like battle standards, she couldn't even manage concern. She faced her doom this time around like a gambler with a pat hand. Oblivion was bluffing. Showboating, even. The wind rushed, then roared in her ears. Enemy arrows, which had been hissing by in arcs, slowed and froze in space as she matched their Erfward journey. She spotted other riders falling away from their tumbling mounts. But though she was no longer technically mounted, she stayed tight in the saddle. Her lifeless red seemed almost to take the fall in a controlled dive. Such a good beast. It knew that losing one's life was no excuse from Duty. The roof passed, the scene changed, and with shocking abruptness, they hit. The stone floor, solid as a rulebook, gave them nothing. Even at that, the great red beast served well, taking the worst of it for her. She was thrown off only upon the first bounce, and she struck the stone in a flat tumble. With half a somersault, she was down and stopped. Her body had massive bruising and tearing, but she was not incapacitated. At least, not until the dwagon's body crumpled over on to her. The Titans played such strange games with their dolls. Incapacitation could take a number of forms. All of them meant that you could not move, could not initiate engagement or disengage, could not personally fight or cast. Some meant that you would croak (or be dusted) if an enemy so much as struck you a single blow. Others, that you would live only until the start of your next turn, unless healed. Sometimes you were conscious, and sometimes not. Sylvia was conscious, and not terribly wounded. But she was pinned, much like she had been hit with pink dwagon goo or another incapacitation special. And she was alone. Lying with her face at the ground, she lifted her head. The only boots she could see moving belonged to the enemy. Fud's fall had been not so bad. All the way down, Fud had looked at his struggling yellow dwagon and tried to think of something to help it. He kicked it with his newly powerful legs. How that worked was this: it didn't. He hit it with his newly powerful fists. How that worked was this: it also didn't. But how it felt was: good! Just at the end of the fall, Fud tried flapping his newly powerful arms. How that worked was this: not at all. How it felt was: embarrassing. Fud and his dwagon landed in a shape that was: okay. But the dwagon had taken more than ten arrows. Enemy stack attacked them right away. The dwagon croaked a few before the enemy croaked it, and Fud put his sword through the rest. He leveled! Fud had less than one order to follow. Fud looked around for more enemy to fight. But then Fud did hear one order. The boots were running in all directions, mostly away. But it was only a matter of time before some random enemy unit would encounter and engage her. Wounded and with only one, weaponless arm free, she would fall to the lowliest stabber. She could not fight and she could not run. So she did what was left and commanded. "Gobwin Knob units! To me!" Sylvia shouted. She could see no friendlies. But some of the enemy soldiers certainly did turn and notice her, and a Jetstone warlord was among them. He was only Level 1, but that would do. From the chaos, he added a fourth and fifth random infantry unit to his stack of three, and charged her. Fud followed the one order. He found Lady Sylvia Lazarus and stacked with her and got her leadership bonus. She couldn't move, so he had to croak everything himself. He croaked a warlord. He leveled again! How it felt was this: fun. Once the skirmish was finished and Sylvia knew she would survive (at least long enough to fight in the rest of this battle) it took her all of a minute to decide that wasn't good enough. The Atrium was slowly emptying of retreating enemy troops. She wanted to do something to hit them here, so that they would become her side's troops. But she could not move. She looked at the Hobgobwin heavy. Her only bodyguard. "Unstack," she ordered him. "Go out and find Captain Archer if you can, and bring him back here." The Hobgobwin, which did not speak Language, nodded in complete understanding of her intent and hobgobbed off. On the face of it, this was a stupid risk. Any ordinary warlord would never overplay her hand this way. But she and "the end" were playing a tournament today, and she was leading. She would bet her life against that bluffing blowhard again and again, for even a little bit of gain. She would bet oblivion right off the table, even if she herself was bluffing. And this might be a very nice gain she was playing for. She had called for the only archery-capable warlord in the battle group. Should the Hobgobwin return with him, his ranged attacks plus her leadership would allow them to drop as many targets as they had arrows. 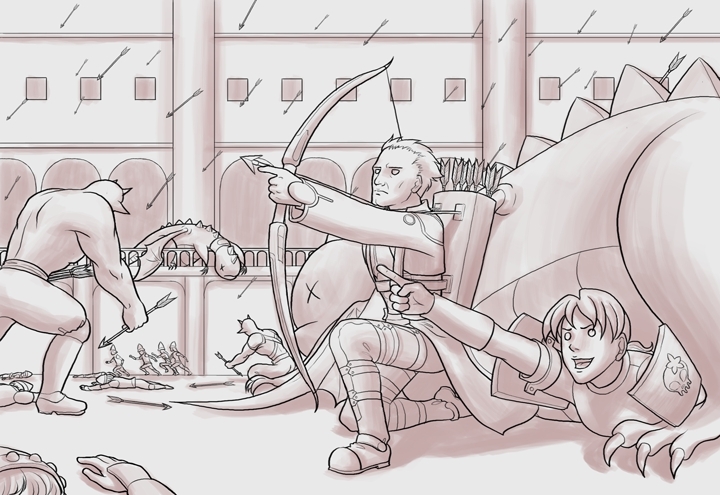 And then...well, they could gather more arrows. This time, she could let herself lie perfectly still and do nothing. She had done all she could, and it was up to Fate. She relaxed. As far as the enemy was concerned, she was only a lifeless body. A role she was popped to play. She lost count. But when the Hobgobwin returned with another Hobgobwin, and a grinning and almost unscratched bow-wielding warlord, she had recited it more than ten times. This page was last edited on 28 January 2011, at 14:38.